The Hurricanes golf team has caught spring fever. 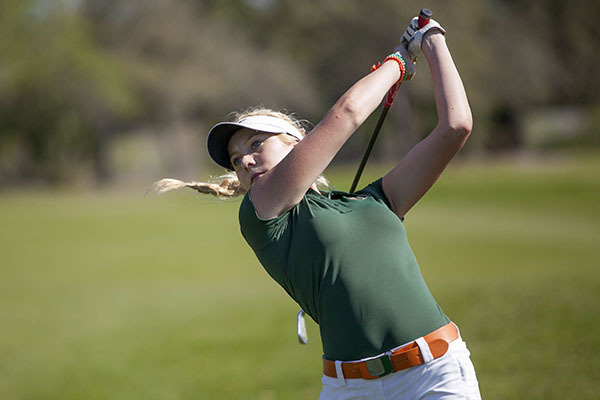 Amid the peacock calls and lakes filled with lily pads, Miami finished third for the second consecutive year at the annual Hurricane Invitational, which ended Tuesday afternoon. The team is gaining confidence and making a statement after a rocky fall season. Deering Bay Yacht and Country Club in Coral Gables hosted the three-round tournament on Monday and Tuesday. No. 23 Baylor won the overall competition with a score of 883, followed by No. 48 Texas State (887). The Hurricanes, ranked No. 71, finished with a final score of 898. The highest ranked team, No. 11 Oklahoma State, finished fourth with a total score of 902. The third-place finish is a huge step for Miami to move up in the rankings. “It’s a really big win for us. Any team that we beat that’s ahead of us helps us climb up to get to where we need to be to make it to regionals,” assistant coach John Koskinen said. The Hurricanes got off to a slow start to begin the tournament. Sophomore Leticia Ras-Anderica, the leading scorer for Miami, shot 216 overall despite a first-round score of four over par. Her frustration was evident when she struggled to make a clean par putt at hole 13. The ball laid to rest right next to the cup, and the sophomore tapped it in for a bogey. Coach Patti Rizzo was called over and she guided Ras-Anderica back to confidence. The sophomore shot 68 – three under par – in round two. Sophomore Rika Park also turned in a solid performance, finishing only three shots behind Ras-Anderica. She started well and scored 69 in round one. A triple bogey in round three was her biggest error. All seven players participated for Miami.